Charleston, SC: The History Press, 2013. 192pp. Summary: Anyone who has attended Illinois State University has traveled at least a few miles on Interstate 55, and some older alumni will recall making the journey on old Route 66. 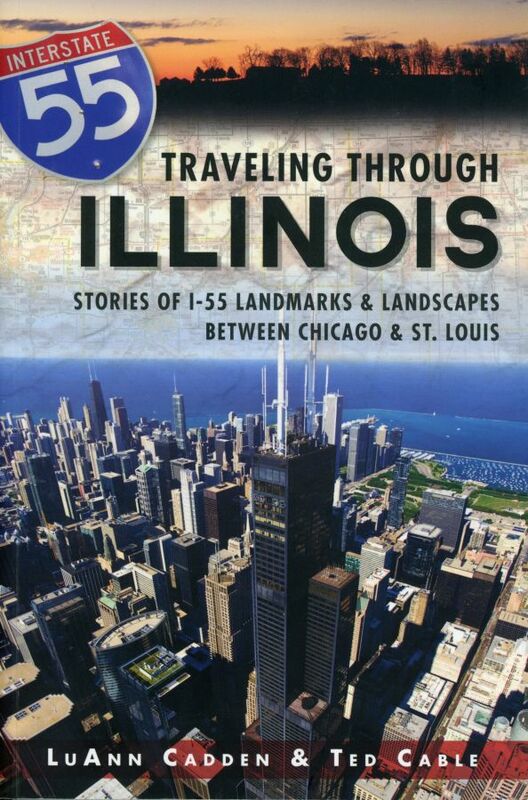 As Cadden and Cable point out in their Preface to Traveling Through Illinois, many books have been written about Route 66 but none on I-55. Their goal is “to change the drive between Chicago and St. Louis from being barely endurable to enjoyable,” and they succeed admirably. The book combines nostalgia of Route 66 with the modern interstate. The Introduction gives some historic background. In August 1915, Illinois Highways magazine proclaimed the dusty road running parallel to the Chicago & Alton Railroad tracks the “Pontiac Trail.” Route 66 was born in 1926, and by the mid-1970s, the less-loved Interstate 55 had become the major north-south highway. Traveling Through Illinois is divided geographically: Part I gives a short discussion of state symbols and a highway guide; Part II presents the southbound journey from Chicago to St. Louis; and Part III reverses that journey. Although Parts II and III cover the same ground, a different vantage point encourages the driver and passengers to see the landscape from a fresh perspective. The journey in Part II begins on Chicago’s lakefront. After merging onto I-55, the Bronzeville neighborhood (mileage marker 293) is on the left. Bronzeville, explain the authors, has been home to African Americans since the Great Migration. Soon, at the I-94/I-90 junction, we pass Chinatown, then the many other neighborhoods that provide metropolitan Chicago with such a vibrant history and present-day ethnic mix. Sadly, in a short summary one must concentrate and, in this case, bypass the many interesting aspects of the natural, architectural, and human environment Cadden and Cable discuss. Near Chenoa, at mileage marker 185, a quick look to the right reveals a beautiful round barn. The first round barn in the U.S. may have been built by George Washington, and round barns were popular between the 1880s and 1930s because of their efficient design. But look quickly because at marker 184, there is an icon of 21st century life: a cluster of cell phone towers. Money Creek … Towanda … Duncan Manor … exit 168 marks arrival at Normal-Bloomington. Continuing to head south to mileage marker 150 is a rest area that is the halfway point between Chicago and St. Louis. How can anyone make driving through boring cornfields interesting? 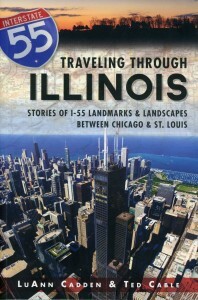 The authors of Traveling through Illinois have managed to provide fascinating details augmented by black and white photographs in a vibrant discussion that will entertain and educate anyone traveling along I-55. Drivers, remember to take a passenger so you can keep your eyes on the road! About the Author: This is the second book for LuAnn Aiello Cadden, ’93, the first being Driving Across Missouri, also coauthored with Cable. She teaches in the St. Joseph School District and is a writer at SJC Copywriting Solutions. She and her husband, Mike Cadden, D.A. ’96, in English, reside in St. Joseph, Missouri. Boston and New York: Houghton Mifflin Harcourt, 2013. 240pp. 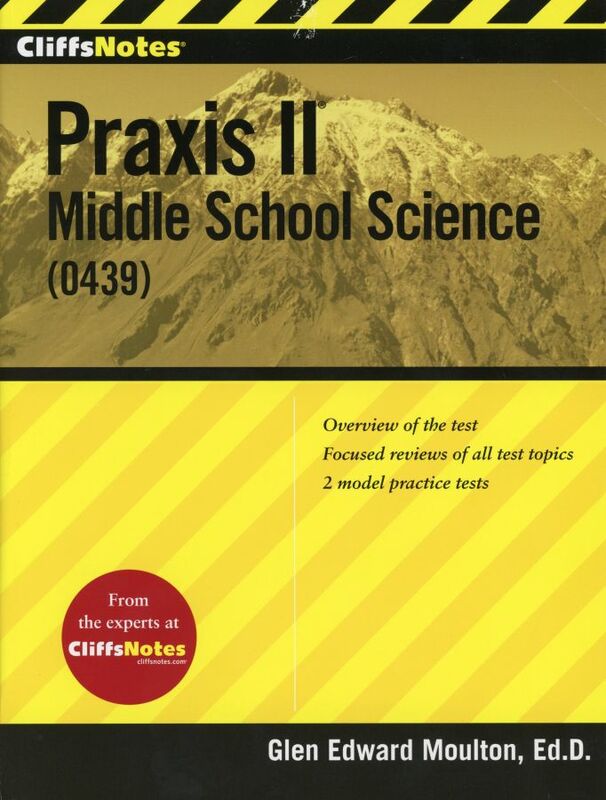 Summary: This text is written for pre-service and classroom teachers who need to take the Praxis II Middle School Science (0439) exam. Moulton points out in his Introduction that many states require a passing score on this exam for certification and employment, and teacher education programs at numerous universities require it. This text will help to prepare, as well as to gain confidence for the actual test-taking situation. The book is divided into two parts: Subject Area Reviews and Full-Length Practice Tests. The seven chapters in Part I include the following subjects: (1) Scientific Methodology, Techniques, and History, (2) Basic Principles of Science, (3) Physical Science, (4) Chemical Science, (5) Life Sciences, (6) Earth and Space Sciences, and (7) Science, Technology, and Society. Each chapter is further subdivided, and the detailed Table of Contents clearly directs users to the appropriate section. In each section, there is an explanation and discussion of the specific subject, with detailed illustrations as necessary, a glossary of relevant terms, and a short test of review questions with the answers and explanations. Consequently, the book achieves what it sets out to do: present clear explanations and provide immediate reinforcement so that users will know if they comprehend the material satisfactorily. The two chapters in Part II offer full-length practice tests covering all topics from the previous chapters. 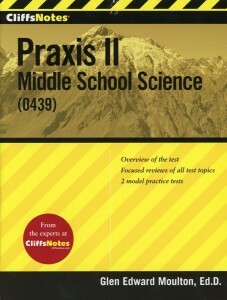 These multiple-choice questions and constructed-response questions reflect the format of the Praxis II Middle School Science (0439) exam. Answer keys for the multiple-choice questions provide immediate feedback. About the author: Glen Edward Moulton ’73 went on from ISU to complete a doctorate. He has served 36 years in public education in such diverse roles as high school and community college administrator, science curriculum supervisor, and adjunct professor. He has taught in inner-city Chicago and rural Maryland. Included among Moulton’s published work are several textbooks and Professional Teaching Knowledge, an online course for pre-service and first-year teachers. He and his wife live in Applegate Valley, Oregon.